Tips for what to do in Austria. Austria might be a small country, but it’s full of culture. Of course, Vienna is a focus point for music and the arts but you can find a wide variety of festivals taking place across the whole country. Here’s a list of ten festivals in Austria that take place outside the capital – ranging from high culture to more quirky festivals and the obligatory music festivals too. 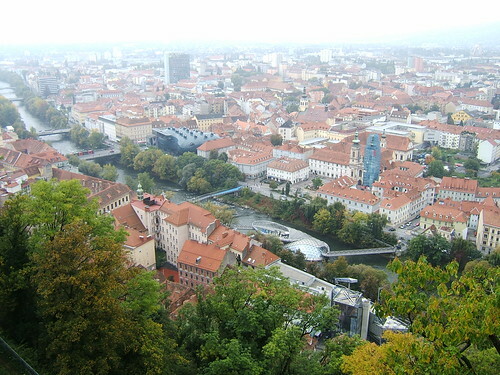 The International Mountain and Adventure Film Festival (or in German, Internationales Berg und Abenteuer Filmfestival) is held each year in Graz, usually in November. Obviously, Austrians know something about mountains so a film festival focusing on these kind of films makes sense! 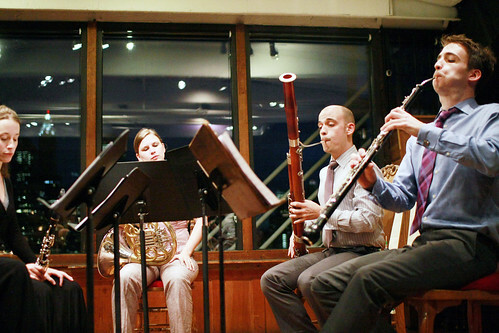 AlpenKammerMusik or Chamber Music in the Alps is a chamber music festival that takes place every July or August in the Alpine village of Liesing. Professional musicians from around the world come to play with the Austrian Alps in the background. This entry was posted in Austria, Events in Europe on August 15, 2012 by Amanda Kendle. Austria may be a small country, but there are lot of wonderful places to visit. Vienna is one of my favourite EuropeanÂ cities, but this post will focus on things to do in Austria outside the capital. If you ask someone to name an Austrian city outside Vienna, Salzburg is probably the first place they’ll think of, and with good reason. Take a look at Inka’s post on the “hard” and “soft” ways to visit Salzburg, and at Arwa’s four top Salzburg sightseeing tips, and you’ll see there is plenty to amuse you. 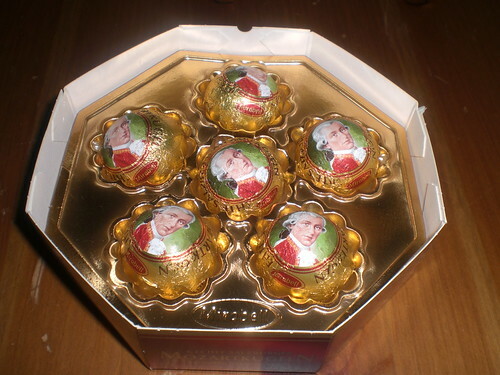 Eating Mozart Kugel chocolates and exploring the castle, Festung Hohensalzburg, would be my top tips for Salzburg. Not so well-known, but easily the most fun place I’ve ever visited in Austria, is the small village of Bad Blumau – and more particularly, the Hundertwasser-designed Rogner Bad Blumau resort. It’s a totally unique place with incredible spas and pools but mostly memorable for the quirky Hundertwasser design – nothing is straight and everything is colourful. Jeremy wrote a great post about visiting the village of Pinswang, a small town close to the German border in northwestern Tirol. It’s a convenient base for some alpine exploration and a nice way to get a taste of rural Austria. 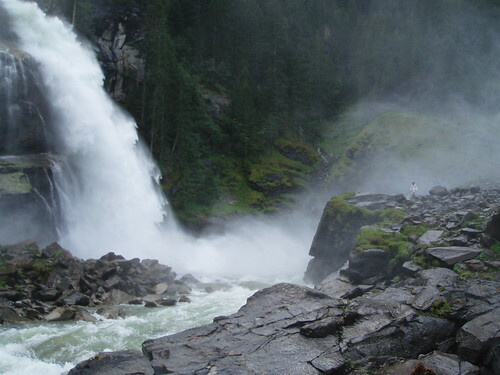 Andy mentioned the Krimml Waterfalls (called Krimmler by Germans, just to confuse us) in his post on great European waterfalls, and with good reason. They are the highest falls in Austria and are found near the village of Krimml in Salzburg state. Karen visited Eisenstadt by accident but found it had much to recommend. 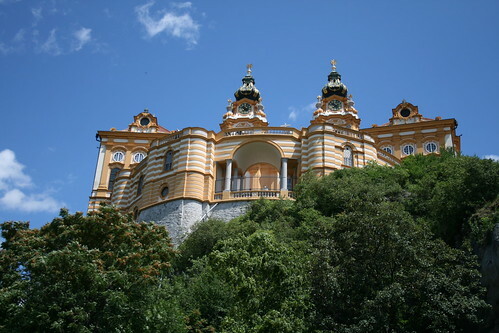 It’s in the far eastern part of Austria close to the Hungarian border and is home to the impressive Esterhazy Castle. Composer Joseph Haydn also lived in Eisenstadt and you can visit his mausoleum. 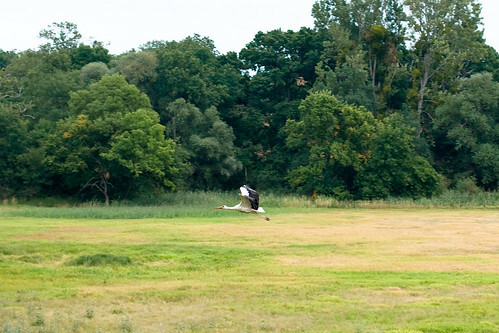 When I lived in Bratislava, close to the Austrian border, I was told by many locals that I should hop across that border and visit the stork sanctuary in Marchegg. It’s affiliated with the WWF and sometimes has volunteers there to answer questions while you walk around the sanctuary – storks from Africa nest there between March and August. Graz is another lovely Austrian city – the second-largest after Vienna, although it’s not particularly big. Neha recommends the Schlossberg, a hill which dominates the Old Town area and has a ruined fort on top it, and fantastic views over Graz and the Austrian countryside. 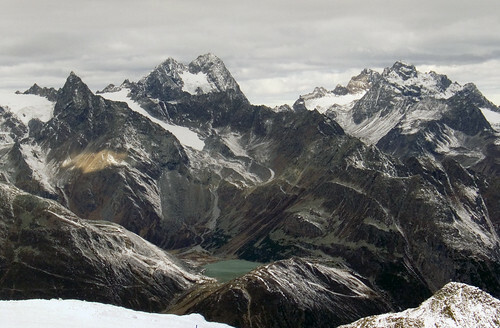 The Austrian region of Zillertal is so famous for its local produce that it’s referred to as “nature’s dining table”! There are several different food festivals to enjoy in Zillertal throughout the year, but it’s also a great spot for hiking and Nordic walking in summer. One of my favourite white Christmases ever was spent with my sister and brother-in-law on (generously enough, on their part) their honeymoon! We stayed in the tiny village of Haldensee in the Tannheim Valley region, not far from the German border, and close to several ski resorts. We picked it because it seemed to guarantee a white Christmas and it didn’t disappoint. The Melk Abbey, near the village of Melk and an hour or so west of Vienna, is aÂ Benedictine abbey dating back nearly a thousand years! The current building dates to the 1700s and overlooks the Danube – it’s a pretty impressive sight. Subscribe to the Europe a la Carte Podcast in itunes. This entry was posted in Austria on June 15, 2012 by Amanda Kendle. Iâ€™ve wanted to explore Vienna ever since I saw the movie Before Sunrise where two strangers meet on the train to Vienna and decide to explore the city together. They have only one day, so they make the most of this beautiful city by walking around. But of course they are a little broke, so they mostly choose places where there is no entrance fee. You on the other hand can add to the experience by visiting some of its most important museums. And keep in mind that holders of the Vienna card get discounts. Vienna wouldnâ€™t have been complete without a museum dedicated to the famous Austrian neurologist Sigmund Freud. Sigmund Freud Museum is where Freud started his first practice and it is a tribute to his life, and of course, psycho analysis. If you are in Vienna at the end of November, you might want to combine a visit to the museum with a visit to the movies, as A Dangerous Method will be coming to the theaters. The movie depicts the relationship between Carl Jung (played by Michael Fassbender) and Sigmund Freud (whoâ€™s played by Viggo Mortensen). The museum is open every day from 9am to 5 pm and admission costs 7â‚¬ (5.50â‚¬, if you own a Vienna card). This entry was posted in Austria, Museums & Galleries in Europe and tagged Vienna on November 6, 2011 by Pinar Tarhan. The Zillertal region is another Austrian hidden treasure, like Burgenland, which I visited in May 2011. The Zillertal region is referred to as nature’s dinner table because of all the local organic produce. I really like the look of the Melchermuas (pancake made with the creamy hay-milk) that Matt Carroll prepares and eats in the video. Pancakes are big in Zillertal, there’s even a Krapfen (another type of pancake) Festival in Schwendau in August. In July there’s the Schmankerl Food Festival, where you can sample local dishes such asÂ Graukassuppe (grey cheese soup) and Schlichtanudeln (a pasta dish) accompanied by traditional music. This entry was posted in Austria on September 7, 2011 by Karen Bryan. UK residents can win a five night holiday for two to Burgenland, eastern Austria in the Hidden Treasures Competition run by the UK Austrian National Tourist Office. The fab prize includes return flights, hotel transfers, five nights half board at St Martins Lodge and three excursions. I spent two nights in Burgenland in early May 2011, staying at St Martins Lodge. I went on the hotel’s bird watching tour to Lake Neusiedl and spent some time in Rust and Eisenstadt. Burgenland certainly is a hidden treasure, so why not enter the competition to experience it for yourself. The closing date is 30 September 2011. This entry was posted in Austria on July 7, 2011 by Karen Bryan. When I was in Vienna in May 2011,Â Andreas Susana, editor of Notes of a Traveler and tweeting as @Travelwriticus very kindly came up from his home town of Graz to give me a guided walking tour of Vienna.Â Here are the best ofÂ my Vienna photos. Vienna is renowned for its rich architectural heritage and our Vienna walking tour kicked off with a look at some examples of this.Â The 1987 Vienna University of Technology library has sculptures of owls along the side of the roof and one large, rather elongated, owl on a corner. The curved shape of the windows reminded me of Rennie Mackintosh’s Scotland Street School in Glasgow. Karlsplatz Station was a stop on the Vienna Stadtbahn, constructed in 1899 in the Jugendstil style, the local version of Art Nouveau. The station was almost destroyed during modernisation of the railway to the U-Bahn in the 1980s but a public protest saved it. The Secession Building is another example of Jugendstil architecture. It opened in the late 1890s to house the works of the the artists, including Klimt and Olbrich, who’d formed the breakaway Union of Austrian Artists. The building has a beautiful ornate gold sphere on the roof but I couldn’t get a decent photo of it. At the side of the Secession Building, there’s a sculpture of the Roman general Mark Anthony by Arthur Strasser. I’d read about the Palmenhaus in Kimberley’s Europe a la Carte post, but it was even more impressive than I imagined, probably party due to it being such a sunny day. Around the corner was the baroque style Austrian National Library, formerly the library of the Hapsburg royal family. Andreas reckoned that, being a Scot, I’d appreciate seeing the Scottish Church. There are many fountains in Vienna but I liked the backdrop of the Gothic City Hall at this one. I thought I couldn’t visit Vienna and not go to one of its famous cafes.Â We had a snack at the Cafe Central, previously frequented by the likes of Trotsky, Tito, Freud and Lenin. I have to say that although the interior was beautiful, I didn’t think that the coffee was that good. There’s been a church on the site of St Stephen’s Cathedral since the 12th century. The current building dates from the 14th century. However the diamond shaped pattern on the roof was added in the 1950s. A big thank you to Andreas for this personal guided tour of Vienna.Â I’m just sorry that I had so little time in Vienna, I feel I barely scratched the surface. You can see all my Vienna photos on Flickr. Our “Best of Vienna Travel Tips” collation will give you plenty of ideas for you trip to Vienna. We’ve also researched some of the best places to stay in Vienna for all budgets. You can also read about 10 must-see Vienna museums. This entry was posted in Austria, Photos and tagged Vienna on May 23, 2011 by Karen Bryan. I only visited the city of Eisenstadt in Burgenland in eastern Austria because of a lost in translation moment. I’d enquired at the reception desk of my hotel, St Martins Therme & Lodge, about the best driving route to the town of Rust, on the western shore of Lake Neusdield. The receptionist told me that there was a ferry from Morbisch an See, just south of Rust. I reckoned this would save me doing the return half circuit of the lake. My plan was to be back at the hotel in time for a swim in the outdoor pool before dinner. However, when I arrived at the ferry in Morbisch am See, I discovered it was a ferry for foot passengers and bicycles but not cars. As I drove back through Rust I noticed a road sign saying that it was only 15 kilometres to Eisenstadt, so I thought just go for it. I’m really glad I did. Yes, I missed my swim and 5 course dinner at the hotel (with a quick meal at a fast food restaurant as a poor substitute), but Eisenstadt was beautiful. One good thing about arriving in the evening was that it was easy to find a parking place just opposite the Bergkirche. The Austrian composer Joseph Haydn lived in Eisenstadt and the Hadyn Mausoleum is at the back of Bergkirche.Â I arrived there are 18.50, ten minutes before closing time. The grand Esterhazy Castle was the main home of Prince Esterhazy, a Hungarian noble, as this area was part of Hungary until 1921. Opposite Esterhazy Castle the wine store was bathed in evening sunlight. There was a outdoor cafe in the courtyard of Esterhazy Castle. The Haydn Museum was a five minute walk from the castle. The Plague Column in the main street was constructed in the early 18th century to ask God to rid the city from the plague. There was an Italian food market in the city that week. I loved the golden unicorn decoration at a street corner. So now you can understand why I’m so glad that I made it to Eisenstadt. You can see all my Eisenstadt photos in Flickr. My trip was hosted by the Austrian National Tourist Office UK. This entry was posted in Austria, Photos on May 19, 2011 by Karen Bryan. I stayed for two nights at the 5 star Ring Hotel in Vienna in May 2011, on a complimentary basis. The hotel is in a central location on the ring road that encircles the old town, so very handy for sightseeing on foot. I thought that the lobby of the hotel was quite small for a five star hotel. The decor didn’t appeal to me with features like mini rhino sculptures illuminated in green in a recessed case in the wall. My room was spacious and comfortable, decorated in a traditional, classic style. It was very quiet in the room despite the proximity of a major road. There was a coffee machine in the room. The fresh flowers in the room and bathroom were a nice touch. The toiletries in the bathroom were lovely. There was a wired internet connection and wifi (variable quality), both free of charge, in the room. The hotel has a spa on the top floor with a gym, a steam room and a sauna. I had the steam room and sauna to myself one evening. I only ate breakfast at the hotel’s “At Eight” restaurant. The selection at the “Quick Breakfast” buffet was quite limited for a 5 star hotel with cereal, fresh fruit salad, yoghurt, two fruit juices and a selection of rolls and pastries. Tea or coffee was brought to your table on request. It was possible to order various egg dishes, different fruit juices and a wider range of hot drinks as extras. As I spend the majority of my time at a hotel in my room, it’s the room that matters most to me. I rated my room at the Ring Hotel as excellent for comfort and spaciousness, having free wired internet connection and being so quiet for a city centre. The lobby decor is a matter of taste and I was only there for a few minutes but I do think that the breakfast selection could be extended. Our Best of Vienna Travel Tips collation will give you plenty of ideas for you trip to Vienna. We’ve also researched some of the best places to stay in Vienna for all budgets. This entry was posted in Accommodation, Austria, Hotel Reviews and tagged Vienna on May 15, 2011 by Karen Bryan. My visit to the town of Rust was one of the highlights of my trip to Burgenland in eastern Austria in May 2011. As soon as I got out of my car I spotted several storks’ nests on the the chimneys. There was a stork information tile board which looked liked it had been hand written and painted. The buildings along the main street were very colourful. The pedestrianised town square is very pretty. You can find public toilets at the top end of the square. There’s a fair selection of cafes and restaurants in the town, most with outdoor seating. Next I drove down to the shores of Lake Neusiedl, about a mile from the centre of town, where I was able to parkÂ free of charge for one hour. I decided to go into the Katamaran Restaurant/Cafe for a coffee with a lake view. But I couldn’t resist a piece of their cake, it was so hard to decide which cake to select. I plumped forÂ the chocolate and banana creation. If you are in Burgenland, make sure that the picturesque town of Rust is on your itinerary. This entry was posted in Austria, Photos on May 12, 2011 by Karen Bryan. I stayed at the St Martins Therme & Lodge in Burgenland, eastern Austria for two nights in May 2011, as a guest of the Austrian National Tourist Office UK. Just before the Lodge entrance there’s a pen housing two very curious goats who enjoy being patted. During check in I was offered a glass of locally produced apple juice, as the receptionist explained all the guest facilities. Instead of a room key card, you get a water proof circular key (the size of a small watch) attached to a bracelet and swiping this not only gets you into your room but also into the spa facilities. My room had a large balcony with views over the lake and the spa. I had a sauna and a swim in the outdoor pools on my first evening there. There were a couple of armchairs and a small table by the window. The bed was really comfortable. I was delighted that the room had a wired internet connection free of charge. There was also free wifi in the lobby but I didn’t pick up a very good signal there. The only negative I had with the room was that one morning I was awakened at 7.30am by a rather noisy grass cutting tractor on the area at the lake shore opposite my room. The breakfast buffet was a real treat with its emphasis on local produce. There was a selection of cheeses, hams, jams and breads and you could even slice your own ham. The next morning I went on a bird watching tour in the nearby Neusiedler See-Seewinkel National Park, led by Karin one of the â€œscoutsâ€ employed by the hotel. She took us to an elevated hide to see which birds we could spot. A few days after my tour I received a booklet in the mail with stamps for each of the birds we had seen. Guests who manage to see all the birds listed in the booklet, receive a free weekend at the St Martins Therme & Spa. In summary, St Martins Therme & Lodge is a wonderful retreat with lovely rooms, helpful staff, extensive spa facilities and one of the best breakfast buffets I’ve ever had. You can see all my St Martins Therme & Lodge photos on Flickr. This entry was posted in Accommodation, Austria, Hotel Reviews on May 11, 2011 by Karen Bryan.